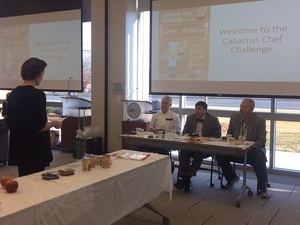 The fifth Cabarrus Chef Challenge, presented by Cabarrus Health Alliance in partnership with the North Carolina Research Campus, is a Chopped Junior-style competition between local Cabarrus High Schools. The 3-day competition starts December 11th. Student teams of 10 each representing Cabarrus County high schools- AL Brown, Cox Mill, Hickory Ridge and Northwest Cabarrus- will compete to create the healthiest holiday dish. The teams will be judged by professional chefs and esteemed community members. The event was created by two school nurses who had a vision to get their students involved in a hands-on activity that would improve decision-making and problem-solving skills while practicing team building. They involved local law enforcement to help create stronger community bonds. Each team represents a health, culinary, wellness or leadership program. Upon arriving, the theme of the competition is announced and a list of pantry items distributed. Each team gets a total of 15 minutes to prepare and plan their recipes and meal around the theme provided. One teammate then gathers the necessary food and spices in the pantry. Each team then has 45 minutes to prepare their meal and create their presentation for the judges, using only the available equipment and resources. After the meal is prepared and plated, each team sends one student to present to the judges. The presentation must include a name, ingredients, an explanation of why they chose to the specific meal as well as why it is considered healthy or nutritious. The judges score the recipes on a scale of one to five, five being the highest, in taste, presentation, teamwork, and following directions. Cabarrus Health Alliance's Meghan Charpentier answered a few questions about this culinary event. Read on to lean more! 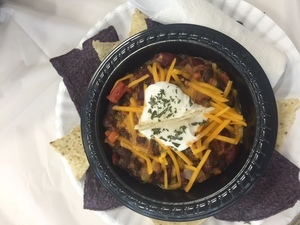 This is the fifth Cabarrus Chef Challenge! Have the past challenges been successful? They have been extremely successful! We have done them at CHA in the Community Rooms and Wellness Kitchen. With the growth of the program to include more schools and its recognition, Forty Six was open to moving the competition there to give it the proper atmosphere for the students to prepare their meals, a chef’s kitchen! Do you see this challenge continuing in the future? Absolutely! I even see more high schools wanting to be involved in future semesters (that is my goal!). The students really do love it and it really brings out great teamwork and puts their skills they’ve learned into real life practice. I see this competition pits schools against each other. Has it always been this way? Yes, it started with the school nurses from Cox Mill and Northwest High Schools coming up with the idea for a cook off between their schools. Both schools have faced off each semester. This is the first time we have had four schools participate, Cox Mill, Northwest, Hickory Ridge, and AL Brown. It is friendly competition, with the winning team receiving the coin from the Concord Police Department, and of course, bragging rights! Cox Mill has won every single time! Who will win this time?! The events will take place on Monday-Wednesday, December 11-13 from 6-8pm at Forty Six. The restaurant is closed for serving, but open to all who want to attend and watch the event. Parents, teachers, staff, friends, and community members are encouraged to come cheer on their schools! Cox Mill vs. Hickory Ridge play Monday night and Northwest and AL Brown play Tuesday, with the winner of both nights competing on Wednesday. This event will be the fifth Cabarrus Chef Challenge. Additional sponsors include Earth Fare, Forty Six, its staff and resources and Castle & Cooke North Carolina. All competitions are from 6 to 8 pm each evening at restaurant Forty Six, 101 West Avenue, in downtown Kannapolis. Parking is available on the NC Research Campus or on Main Street across from the David H. Murdock Core Laboratory building.